ISO 13485 specifies the quality management requirements for medical devices. This certification ensures that the product in question, consistently meets customer requirements and regulatory requirements applicable to medical devices and other related services. The certification was obtained due to the support received from the Market Development Fund (MMF) which granted 2.9 million DKK for Monsenso and its partners to obtain the necessary certifications to launch the solution internationally. 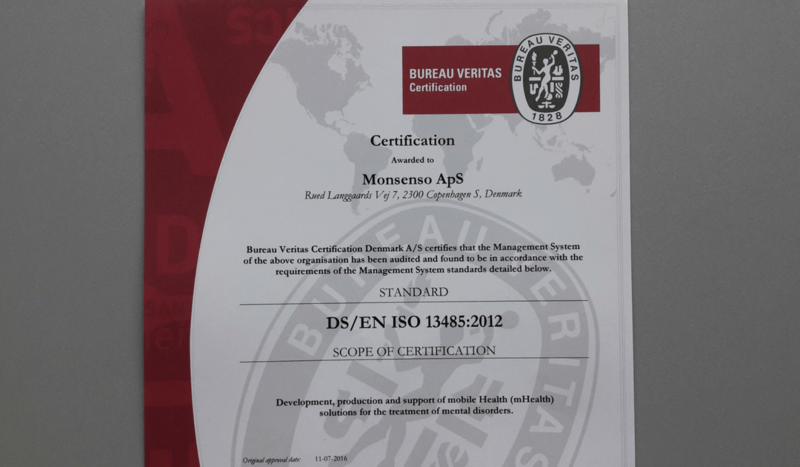 The Monsenso mHealth solution recently obtained its CE Marking and TGA Certification. The next steps for Monsenso are to obtain the ISO 27001 Data Security Certification, and to become HIPAA and FDA compliant, which is also part of the support granted by the MMF funding.